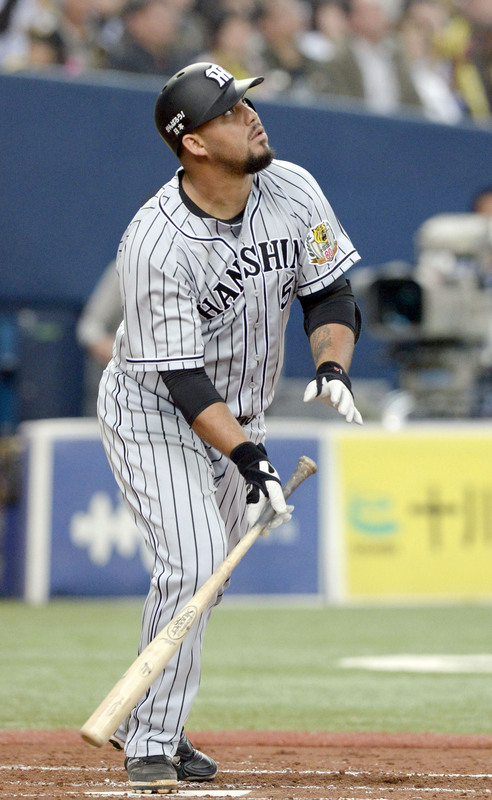 When Mauro Gomez was done hitting in the cage during batting practice on both Friday and Saturday at Tokyo Dome, where the Hanshin Tigers were taking on the rival Yomiuri Giants in a weekend series, instead of heading back to the clubhouse, he went behind the cage for a little more soft toss. With Tom O’Malley, a former Tigers star himself and currently one of the team’s hitting coaches, tossing balls to him, Gomez got in a few more cuts before leaving the field. He later explained that he “likes to take some extra swings, work on my timing,” when not fully satisfied with a batting practice session. Gomez is in his second season with the Tigers and coming off a solid year. He was late in arriving last year — to spring training, he was present by opening day — but didn’t take long to get settled, and quickly established himself as one of the better power hitters in the Central League. Now he’s putting in the work to build upon that in hopes of putting together another strong campaign. Following up a good year with another can be challenging. There’s a feeling-out period on both sides during the first year. In the second, you know what to expect, but your opponents come armed with statistics, videos, and, more importantly, first-hand experience in the quest to identify tendencies and weaknesses to exploit. Against Gomez, opposing pitchers are generally keeping fastballs down and in and trying their luck away with other pitches. Throwing balls down in the zone was how many got Gomez out last season. Knowing that, pitchers are trying to go back to the well early in 2015. Gomez is hitting .242 so far this year, with a home run and four RBIs in nine games. That includes a mini-slump that saw him go hitless in seven at-bats across a two-game stretch. The early hiccups haven’t frustrated Gomez much, not with 134 games left, and he simply redoubled his efforts to get his timing together. Gomez has been working on swinging at better pitches and laying off balls out of the zone. He doesn’t want to give away outs by swinging at bad pitches, and hopes to cut down on his strikeouts by improving his discipline at the plate. Gomez’s first season in Japan meant expectations were going to be high coming into 2015. He hit .283 with 26 home runs and a CL-leading 109 RBIs in 2014, playing all but one game. “I think the hardest year is the first year,” O’Malley said. “You have an idea of kind of what to expect the second year. There are still a lot of things that are new, but you have to hopefully be that model of consistency. That’s what we’re looking for. Kind of like what Matt’s done for five straight years,” he said, referring to outfielder Matt Murton.